One of the most important realizations for someone providing a friend or loved one assistance for their physical disabilities is that the ability to live and function as independently as possible is an important quality of life issue. Two of the most pertinent aspects of daily life that challenge this independence are meal preparation and clean-up. However, with a few adaptations, a bit of planning and foresight, and perhaps some specialized tools and equipment, navigating the kitchen can be made easier and safer for individuals living with disabilities. Here are some tips that can help. A little rearranging can make kitchen work a lot easier. Items that are not used regularly or are purely decorative are best stored elsewhere, such as in another room or in out-of-the-way storage areas. This will allow more space on counters and tables and in easily accessible storage areas for daily use items, such as frequently used pots, pans, utensils, dishes, and seasonings. Using turntables on counters and tables can make accessing those frequently used items easier. Hand operated grabbing tools are very useful for reaching things in awkward places. They are made in a wide assortment of shapes, sizes, and types, so finding a few to meet everyday needs in the kitchen should not be a problem. Planning meals ahead and making a list of necessary ingredients for each one can help reduce back-and-forth travel to gather needed items during meal preparation. If fatigue is an issue, plan meals that can be broken down into a series of steps, enabling breaks between them. If mobility is an issue, a rolling utility cart makes transporting items needed from the refrigerator, cabinets, or pantry easier. This also makes it possible to transport the items you need in one trip. If a wheelchair is used, a lap tray with a beanbag base can serve the same purpose. 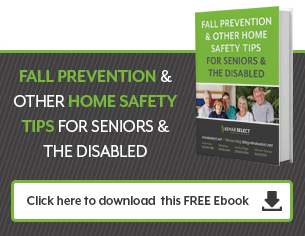 Of course, there are a lot more items and ideas out there for providing help for physical disabilities that can work to make navigating the kitchen safer and easier for your family member or friend. Your local rehabilitation center or your loved one's physical therapist could likely offer some recommendations that are suitable to their individual circumstances, abilities, and limitations.